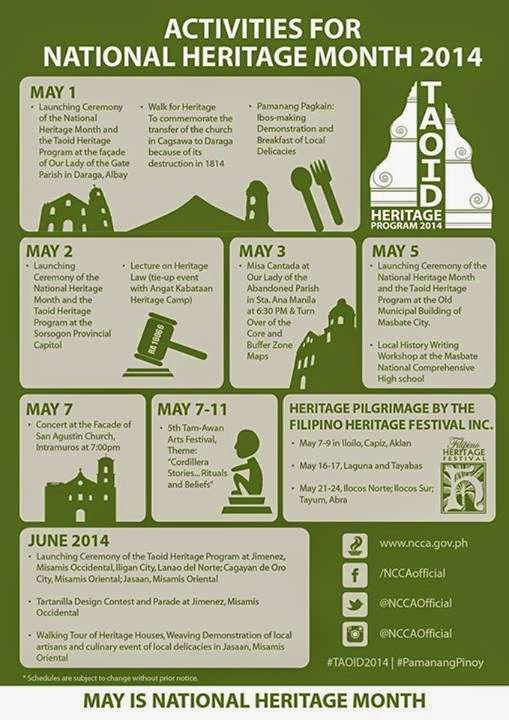 In the Philippines, May is declared a National Heritage Month, and to usher in the celebration, the National Commission for Culture and the Arts (NCCA) will hold Taoid Heritage Program Celebration, an annual yearlong heritage conservation program. 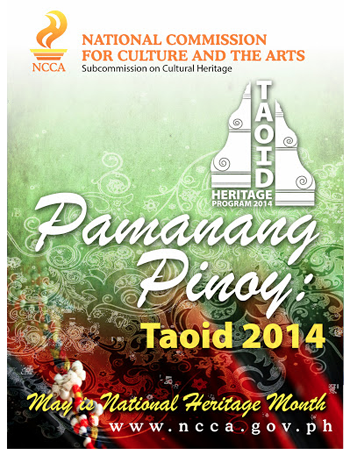 An Ilocano word for “heritage,” Taoid is the flagship program of NCCA’s Subcommission on Cultural Heritage (SCH), which is headed by Commissioner Fr. Harold Rentoria. This year, it has taken on the theme “Pamanang Pinoy: Taoid 2014.” It will give us a glimpse of the legacies of the past and how it remains to shape the present and the future. It is a recognition and celebration of the different aspects of our national cultural heritage—our traditional art forms and practices, important cultural structures both movable and immovable and other objects of national importance whether tangible and intangible. In 2009, the government formally made heritage conservation a legal mandate, by ratifying and implementing Republic Act 10066 or the National Heritage Act of 2009, empowering NCCA and its afiliated agencies in their policy-making and implementation of conservation programs. Heritage clinics will be conducted by the NCCA National Committees on archives, art galleries, historical research, libraries and information services, monuments and sites, and museums. The festivities will kick off in Limasawa Island, Southern Leyte (which is alleged to be the site of the first Catholic mass in the country) on March 31 in line with the 493rd commemoration of the first mass in the Philippines. SCH will conduct an ocular inspection and technical assessment of cultural properties, sites and structures in Limasawa, among them the First Mass marker, schools, libraries, and natural heritage sites. A series of activities will be held in Luzon starting with “Taoid sa ALMASOR (Albay-Masbate-Sorsogon area),” a caravan which will tour around the three provinces from April 30 to May 4. A Spanish word which means “soul sisters,” Almasor invokes a theme about establishing connections or linkages—primarily which Taoid is all about. There will also be a heritage clean-up drive as part of Bayanihan Project Series (BPS). Bayahanihan, deeply ingrained in the Filipino culture, and perhaps one of the striking qualities of the Filipino people, is a selfless act of helping one another towards achieving a goal deemed impossible for one person to accomplish. SCH will also hold heritage school tours entitled “Mga Kwentong Pamana sa mga Batang Bida” which aims to spread the message of heritage conservation advocacy to the younger generation. Actor and athlete Enchong Dee lends his support to Philippine arts and culture as he becomes the National Commission for Culture and the Arts’ (NCCA) ambassador for heritage. Enchong Dee will be a special guest at the “Taoid 2014: Pamanang Pinoy” Heritage Concert, which will be held on May 7, 2014 (Wednesday), at the San Agustin Church in Intramuros, Manila, at 7 P.M. The concert aims to promote and raise awareness of the 2014 Taoid Heritage Program Celebration activities as well as to gather financial support for the rehabilitation of heritage sites devastated by recent disasters. The concert will feature Noel Cabangon, Joey Ayala, the Philippine Madrigal Singers, the UP Singing Ambassadors and the NCCA Rondalla. 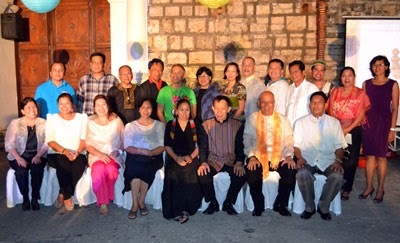 The steering committee of the Taoid Heritage Program 2014 is composed of Fr. Rentoria, head of SCH and the National Committee on Archives; Dr. Stephen S. Totanes, vice head of SCH and head of the National Committee on Historical Research; Lucille Karen E. Malilong-Isberto, SCH secretary and head of the National Committee on Monuments and Sites; Dr. Marilou P. Tadlip, assistant secretary and head of the National Committee on Libraries and Information Service; Robert Bjorn O. Santos, SCH member and head of the National Committee on Art Galleries; and Amado R. Alvarez, SCH member and head of the National Committee on Museums. For more details, contact Rene Napeñas, head of the the NCCA Public Affairs and Information Office (PAIO) through (632) 527-2192 or 0928-5081057. Log on to www.ncca.gov.ph or email us at ncca.paio@gmail.com.